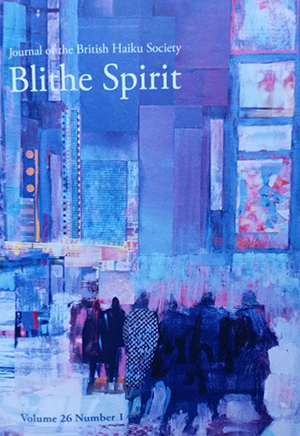 Blithe Spirit, our journal, is a Quarterly, with the cover dates of February, May, August and November to some extent reflecting the season just ended, i.e. the February issue contains a section of winter haiku, etc. The name of the journal was suggested by our first President, James Kirkup, as a tribute to the great British haiku scholar, R H Blyth, to imply the spirit in which we hope to go about our art, and to suggest that haiku belongs in the poetry world, with a gentle nod towards Shelley’s skylark. Each issue usually consists of around 80 pages, with original poems covering the gamut of haikai genres, a diversity of articles about the writing and appreciation of haiku and related forms, book reviews, letters to the editor, features and announcement of the winner of the Museum of Haiku Literature Award (£50) for the haiku chosen as best from the previous issue. Our editorial policy is to encourage new writing, value a diversity of approaches to haiku, and promote excellence. Blithe Spirit is principally a membership journal, however, members do not have an automatic right to publication. All submissions should be original work, not previously published or under consideration elsewhere. Works posted by authors themselves on social media, that have not undergone an editorial process are welcome. From its inception the British Haiku Society has always maintained certain key principles in line with traditional haiku values. These can be expressed thus: a haiku should derive from spontaneous, concrete, personal experience in a certain moment of heightened awareness; when putting such an experience into words regards should be had for a certain mellifluity – a haiku should flow easily – a careful choice of words should aim for what Martin Lucas called ‘poetic spell’. It should be clear that the writer has contrived to observe something which usually escapes ordinary notice, helping the reader to have a feeling of what William Carlos Williams called ‘the renovation of experience’. This is not a sine qua non checklist; the recommendations need to be internalised so that they inform haiku production in an other-than-conscious kind of way. All these things apply, turn and turn about, to related forms appearing in Blithe Spirit, haibun and tanka, etc. The address for postal submissions will be provided in the members’ newsletter the brief sent to the membership. For those preferring to submit by post, please send a covering note and a stamped self-addressed envelope or one IRC if you wish for a reply.